I was busy working away making up arrangements of fresh flowers for a funeral, at my Florists Workshop one day last October. I always listen to the local Chichester radio station Spirit FM whilst I am working. My ears pricked up when I heard that Prince Harry and Meghan – the Duke and Duchess of ‘West Sussex’ ! - would be visiting Chichester and Bognor Regis the following week. 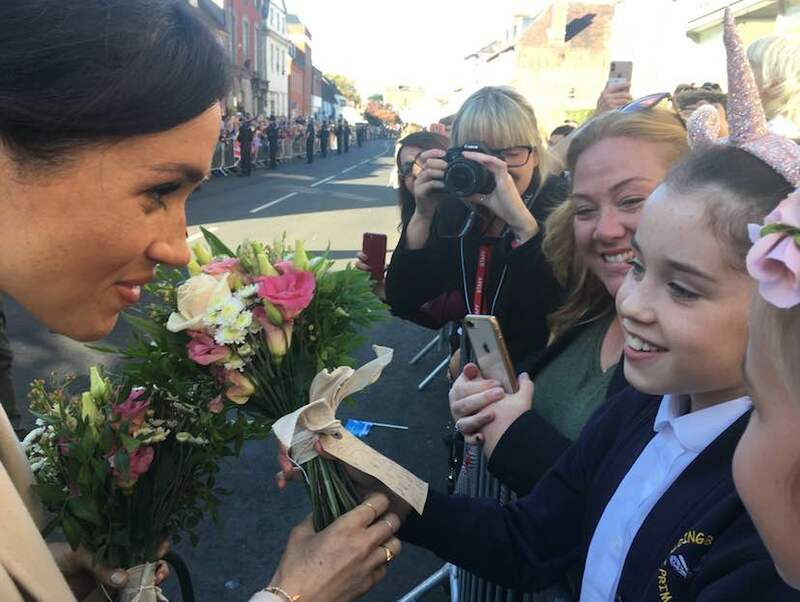 My instant reaction was – what a fantastic photo opportunity – how can I get a picture of Meghan holding some of my flowers ! I heard that the couple would be visiting the new Chichester University building complex in Bognor Regis, so straight away I emailed a regular customer and former bride, who works there, to see who I could contact in order to gift a bouquet of fresh flowers, for someone to present to the Duchess. She didn’t reply and eventually I found out that unfortunately Lesley had been made redundant. 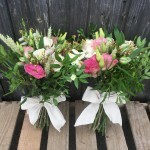 So, when I received a phone call a couple of days before the Royal visit from Zoe, asking if I could make a couple of little fresh flower posies, because she was taking her daughter and her friend into Chichester to stand in East Street, near Edes House, to hopefully see the couple – I thought – Here we go ! Here’s my chance ! I wanted to make something really pretty that might catch the couples attention, whilst they walked through the street. Irealized that the place would be packed with lots of people trying to the same thing, so I made two matching really pretty hand tied posies of Cream Roses, Pink Lisianthus, White Stallion Chrysanthemums, Wax flower, White Alstromeria with some foliage and dried corn, then I wrapped the stems with some lovely linen ribbon. I attached a brown card luggage label to each posy, with one of my Earth Seed to Bloom stickers on one side - leaving the other side blank of each of the girls to write a message on. 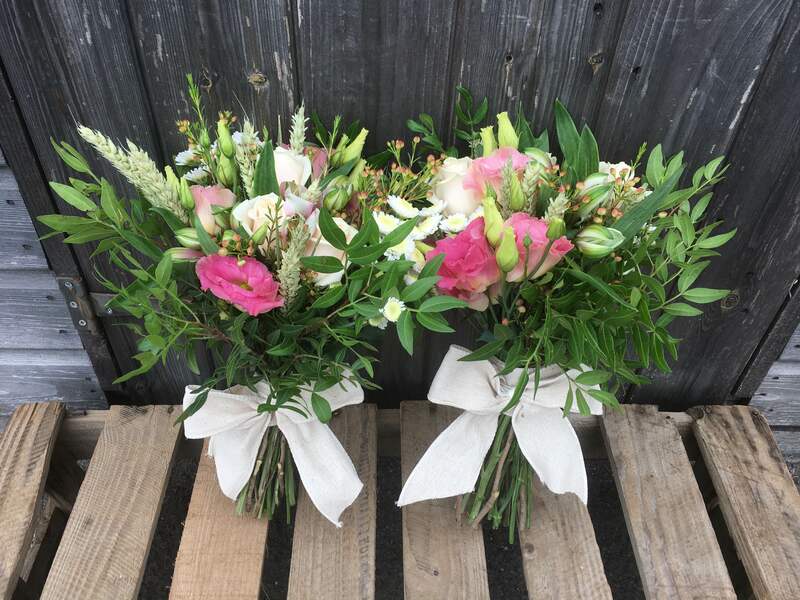 When I delivered the flowers to Zoe, she was really pleased and assured me that she would let me know how they got on and if everything worked to plan, she would take lots of pictures and send me any good ones. On the day, I had lots of orders, so couldn’t get into Chichester myself, but I did listen to the coverage on the radio. 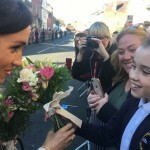 At lunchtime Zoe rang me , she was so excited and described how Meghan had seen the Girls with the posies and crossed the street to talk to them, and the girls had given her the flowers. 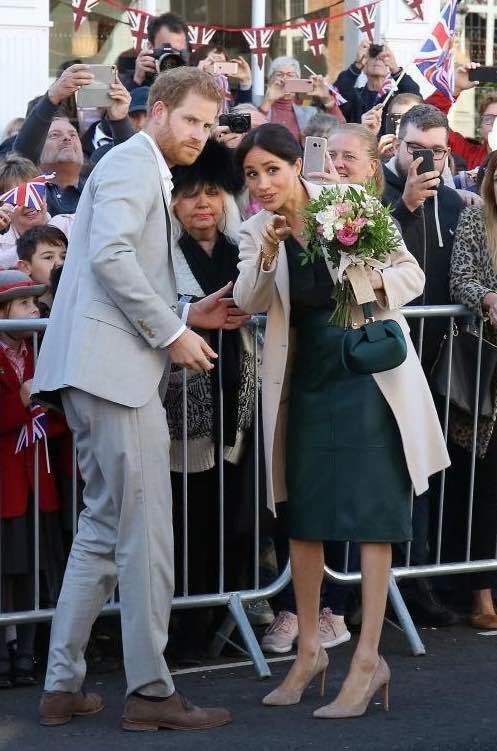 Meghan had then gone back across the road and sent Prince Harry over to speak to them too ! Zoe took some amazing photos, one of which is on the first page of my Website. In the picture above, you can see the girls writing on the label - just a shame it isnt showing my logo ! So, everything worked out well and thanks to Zoe, I have some amazing photos of the Duke and Duchess of Sussex featuring my flowers ! A great day for Earth Seed to Bloom.